Many New Brunswick athletes from all across the country took to Montreal for the McGill Team Challenge this past Friday and Saturday. The largest track meet in Canada also had an impressive field of athletes including eight Olympians, notably Luguelin Santos, silver medalist in the 400m at the London 2012 Olympics. - Grace Annear of Hampton, running for University of Victoria, by far had the most impressive run from New Brunswickers. On her route to claiming 1st in the event, Annear not only destroyed the 600m New Brunswick record by over a second, but she also did so in a meet record with a time of 1:30.72. The day prior, Grace placed 9th in the 1000m with a time of 2:53.84. - Lydia Frost of Bocabec, running for Speed River Track Club, placed 12th in the 3000m with a time fo 10:01.77. 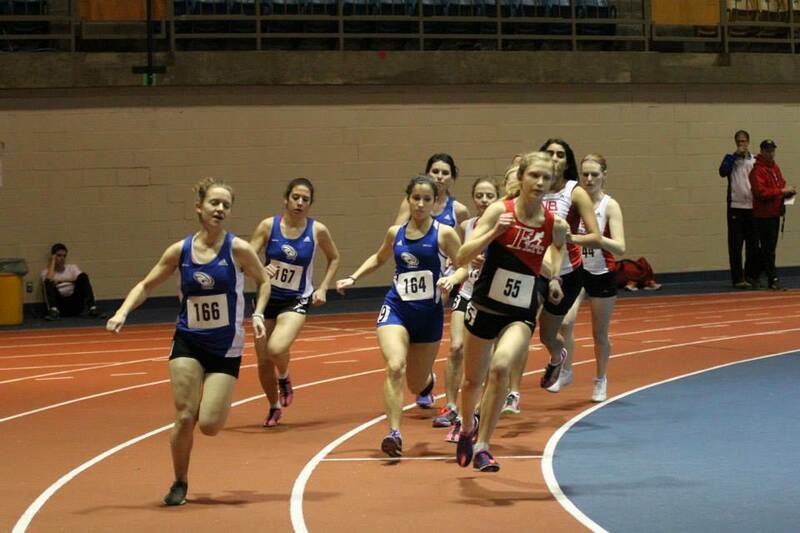 - Alexa-Maude Mallais of Moncton, running for ASEA Track Club, placed 12th in the 60m finals with a time of 7.79. -Pierre Landry of Saint-Louis de Kent , Club ASEA finished 2nd in the Long jump with a leap of 6m94. - Stephanie Doiron of Rogersville, competing for Universite de Moncton, did not finish her pentathlon but during it jumped an incredible 1.71m in the high jump, which ranks her 5th in the CIS. -Naomie Maltais of Val D'amour, competing for l'Université de Moncton, finished 9th in the women's weight throw with a toss of 13m50. - Chris Robertson of Moncton, competing for Western University, placed 9th in the long jump with a best of 6.51m, as well as 19th in the high jump with a height of 1.80m, and 22nd in the shot put with a distance of 11.04m. - Jason MacKenzie of Moncton, competing for ASEA Track Club, placed 3rd in the pentathlon with a score of 3453. - Jordan Johnson of Canterbury, competing for University of New Brunswick, placed 13th in the high jump with a height of 1.90m. NBIAA announced yesterday that the female and male teams from Saint John High School have been selected to attend the 2014 Track & Field Nike High School Grand Prix in Toronto, May 8-11th. Over 300 student athletes from 12 provinces and territories will gather for a track and field experience like no other. It’s a chance for high school athletes from across Canada to come together in competition, celebration, and team pride. Male and female high school teams, selected from each provincial or territorial school sports association will take part in 10 events testing their abilities and dedication. They’ll also enjoy a weekend full of activities including fun tours of the city, educational panels, and social events. In one amazing weekend, students, coaches and friends will gather to represent the best in athletics – and so much more. New Brunswick Aboriginal Sport and Recreation Authority and Athletics New Brunswick is pleased to announce the athletes selected to represent the province in Track and Field at the 2014 North American Indigenous Games. The athletes will compete in Regina, Saskatchewan from July 20th - 27th. The team head coach is Sheila Francis from Esgenoopetitj First Nation while the assistant coach is Tammy Francis, also from Esgenoopetitj First Nation. "These athletes aged 14-18 are among the best in the province and we are extremely proud to work with the NBASRA in helping prepare them for the Championships" said Gabriel LeBlanc Technical Director of Athletics New Brunswick. - Luisa Schwarz (Fredericton) of Fredericton Legion Track Club broke the youth girl's 3000m record with a time of 10:00.17. She broke the previous record held by Sarah Macpherson by almost 3 seconds. - Christel Robichaud (Moncton) of ASEA broke her own F57 shot put record with a throw of 6.12m. - Heather Griffiths, Stephanie Aucoin, Jill Ivany, and Lola White of ASEA broke the Master's 35-40 4x200m and 4x400m relay records with times of 2:21.24 and 5:53.67, respectively. - Mitch Quigg (Saint John) of Saint John Track Club smashed the senior men's pole vault record of 3.70m, set last year, with a height of 4.00m. - Erik Klein (Saint John) of Saint John Track Club broke the Maters 35-40 300m record with a time of 42.91. - Scott McHugh (Lincoln) of Fredericton Legion Track Club broke the Masters 35-40 weight throw record with a throw of 12.28m. - Alex Coffin ( Saint John) of Saint John Track Club broke the Masters 45-50 1000m record with a time of 2:58.15. - Joe Hall (Prince William) of Fredericton Legion Track Club broke the Masters 40-45 weight throw record with a throw of 11.84m, beating out the old record by over 2 meters, as well as the shot put record with a throw of 13.36m, beating out the old record by over 3 and a half meters. - Blaise Lapointe (Oromocto) of Motley Crew Track Club set new records in the Men's T44 600m with a time of 2:12.39, as well as a new record in the shot put with a throw of 9m79. ‘’This competition always produces great results, and this year’s edition did not disappoint ," ANB Director of High Performance, Steve LeBlanc said. "It was a great start to 2014. Several new provincial records and lots of personal bests. A great sign for the rest of this season" added LeBlanc. Members of the university athletes will now travel to the McGill Team Challenge held in Montreal on January 24th and 25th, while the next competition in New Brunswick will be the New Brunswick Indoor Championships that will be held in Oromocto on Febuary 8th. Many New Brunswick athletes were in action this weekend out of the province, competing in other competitions across Canada and in the United States. - Genevieve Lalonde of Moncton, running for University of Guelph, ran the 1500m at the Fred Foot Memorial Meet in Toronto, coming in with a time of 4:34.92. This time ranks her 2nd in the CIS. - Nick MacMackin of Saint John, running for the Windsor Lancers, ran a new personal best of 1:53.41 in the 800m at the Mike Lints Invitational in Allendale, Michigan. This is the 2nd fastest junior 800m ever run by a New Brunswick athlete. At the University of Toronot Meet, Chris Robertson of Moncton, who competes for Western Univeristy finished 2nd in the Men's Pentathlon with 3516 points, just shy of his own New Brunswick Record; however during this pentathlon, Chris set a new provincial 60m Hurdle record with a time of 8.55. - Lee Wesselius of River Galde, competing for St. FX, and Matt McNeil of Saint John, competing for Dalhousie, ran the 3000m at the Athletics Nova Scotia Meet in Halifax and finished 1st and 2nd, with times of 8:33.49 and 8:44:45, respectively. Mike LeBlanc of Riverview ran the 60m at the Golden Bear Meet in Edmonton, coming in 5th with a time of 6.93. A strong field in the men's 60m will feature Jacob Hayes (UNB), Alexander Williston (UNB), Brandon Cleghorn (UNB), and Alexander Peabody (UNB), as well as many others. The men's 1000m event is also set to feature top athletes including Jean-Marc Doiron (O2), Dylan Hebert (UdeM), James Murphy (UNB), Brandon LeBlanc (STU), and Taylor Lamarche (UNB). Athletics New Brunswick, and the Fredericton Legion Track Club is proud to offer the introductory course NCCP in Track and Field, called Sport Coach. This course introduces the coach to the essence of most events in athletics. Registration includes course materials, including a workbook, a reference guide and DVD that covers all events of athletics. The course uses a combination of classroom learning and interactive sessions, hands-on activity designed to give coaches the experience with the techniques and training methods used in all areas of athletics. This course is designed to prepare coaches to coach Track and Field in an introductory competitive environment. The athletes coaches at this level will be working with will range in age from 12-15 years old; the modules are designed to meet the needs of coaches who are working with athletes in a school program or coaches who are new to the club system. In the Sport Coach workshop participants will be introduced to sprints, hurdles, relays, long jump, triple jump, high jump, shot put and discus.triple jump, high jump, shot put and discus. NCCP Sport Coach Athletics New Brunswick, and the Fredericton Legion Track Club is proud to offer the introductory course NCCP in Track and Field, called Sport Coach. This course introduces the coach to the essence of most events in athletics. WHEN: February 28th (evening) to March 2nd , 2014 WHERE: Centre Communautaire St-Anne et École des Bâtisseurs Cost: $ 100 Registration includes course materials, including a workbook, a reference guide and DVD that covers all events of athletics. The course uses a combination of classroom learning and interactive sessions, hands-on activity designed to give coaches the experience with the techniques and training methods used in all areas of athletics. Coaches must be prepared to participate actively in the learning of skills of running, jumping and throwing. This course will be given in English but course material is available in French To register please visit www.trackiereg.ca For more info contact anb@anb.ca or call (506) 855-5003 This course is designed to prepare coaches to coach Track and Field in an introductory competitive environment. The athletes coaches at this level will be working with will range in age from 12-15 years old; the modules are designed to meet the needs of coaches who are working with athletes in a school program or coaches who are new to the club system. In the Sport Coach workshop participants will be introduced to sprints, hurdles, relays, long jump, triple jump, high jump, shot put and discus.